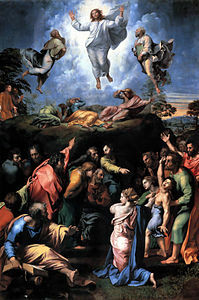 In Transfiguration, Jesus is rising towards the darkened sky, his bodily halo illuminating the clouds around him to a pale ultramarine blue. Jesus is easily identified as the highest figure amongst the many other commoners. The commoners are stationed strategically around the painting. The people and Jesus create a triangular form, which can be compared to a social pyramid. Commoners decorate the bottom, the clergymen are mingling on the higher ground, and lastly, Jesus is the star stationed in the limit, the sky. Raphael’s use of dark patches in the painting emphasize the darkness of humanity without Jesus, but the patches are difficult to interpret what is going on in great detail. It is unclear to see what is going on in the “real” world, he perfectly models the blur of life. The picture painted by Raphael plants many emotions into its viewers: surprise, awe, and curiosity. Perhaps, the viewer may even feel triumph, or the satisfaction followed after success. The position of Jesus forces the people in the picture and the viewer to look up, the faint glow of him represents the “light at the end of a tunnel.” Jesus is essentially the reward after a difficult trial, as portrayed by Raphael.